The Micro Light switch features 1.7 x 0.5-in/4.5 x 1.3-cm of activation surface and only requires 0.4-oz/10-g of force. 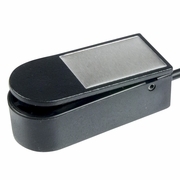 Provides auditory click and tactile feedback. Activated by pressing down on the top of the switch with a feather light touch - just 0.4-oz/11.3-g of pressure required!